Mirabilis californica is one of our most free flowering native plants. If you wanted a plant to set your watch by this is not the one. The Mirabilis californica flowers are open mornings and evenings or if in the shade from late Fall through Spring. The flowers of the Wishbone Bush quickly close when the sun shines on them. Mirabilis californica can be found in disturbed areas that have had a couple of years to recover. Mirabilis californica grows in full sun and sometimes with a little shade. Once the weather turns hot and dry the plants dry up and wait for the next season. It is best to plant your Wishbone Bush in an out of the way location. Mirabilis californica will need to be watered for a while to establish and then should dry out for the summer. 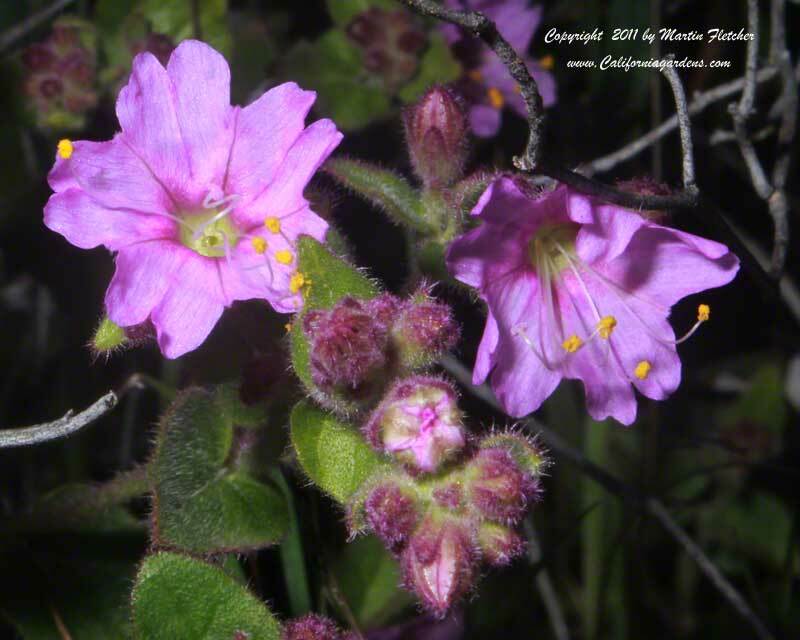 Magenta flowers of Mirabilis californica - Wishbone Bush. High resolution photos are part of our garden image collection.